The Ethnomusicology Program and the Archives of Traditional Music at Indiana University share the sad news of the death of Frank Gillis in Grand Marais, Minnesota on September 17, 1999. 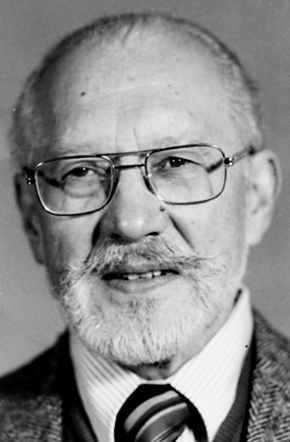 Frank Gillis retired as Director of the Archives of Traditional Music in 1981, where he also served as Associate Director. During his tenure at the Archives of Traditional music, he was responsible for adding a large number of rare 78 recordings of early jazz that now make the collection unique. A consummate jazz musician as well, Frank played with the The Faculty Five in Bloomington and then continued to play piano jazz concerts long after he retired from Indiana University. 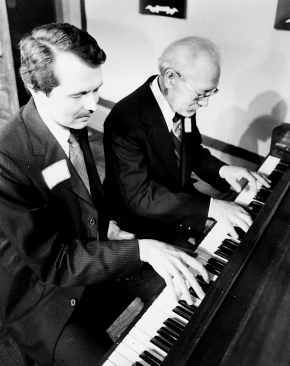 He also served as president of the Society for Ethnomusicology. Frank Gillis mentored many of the students who served as research assistants in the Archives and as tribute to his contribution to their education, a festschrift was published in his honor. We will miss this warm friend who loved life and knew how to live it to the fullest, whether it was canoeing on the Boundary Waters in Minnesota where Frank and his wife, Ruth, had a cabin, or meticulously editing the notes of Frederick Starr who recorded on wax cylinders in Africa at the beginning of the twentieth century. I took a course with him titled "Traditional Jazz." In addition to the class materials, we also learned how to read matrix numbers of sound recordings and how to tell from the numbers whether the first or second session was the final take. He took us to his house and played "Maple Leaf Rag" and other Joplin classics for us. He showed in class a film titled, "Delta Religion," and he had among his reserve materials his personal unpublished ms. on "African Elements in Jazz." He personally got me interested in the legendary jazz drummer Baby Dodds. We will surely miss him and may his soul rest in peace. I first made contact with Frank Gillis in 1998. His pathbreaking "Incunabula of Instantaneous Ethnomusicological Sound Recordings, 1890-1910" (in Problems & Solutions, Occasional Essays in Musicology presented to Alice M. Moyle, 1984, Hale & Iremonger Pty Limited, Syney, NSW, Australia) had a tantalizing reference to Sephardic field recordings. I followed up with phone calls and correspondence, reaching him in retirement in Minnesota. I was immediately struck by his graciousness, and how willing he proved to help an obsessed amateur researching a relatively obscure nook of the world's music. Living here in the Netherlands one doesn't always get the latest news about ethnomusicologists in the States. However, through your website I learned about the death of Frank Gillis last year. As a fellow sound archivist and librarian, Frank and I worked together a lot. In SEM it was the Archives Committee of those days and many lunch meetings, and later when he was president of SEM, I was a Vice President. Also many times when I would visit the Archive in Bloomington, I would stay at their house. Perhaps the most outstanding memory of their generosity and Frank's musicality was once when I was visiting, the Preservation Hall band from New Orleans was in town. After the wonderful concert Frank and Ruth invited them home and then the fun really began. I know it was a "moment plucked from time" but I'll never forget it. As I will never forget Frank. God Bless you Frank wherever you are now.